Ankle sprain or ligament injury is a very common injury in sports, work, and normal daily activities. It accounts for a large amount of disability and time out of work and sports participation. The foot and ankle form a complex supporting structure for the body, with the ankle providing a large part of foot motion in the plane of forward motion. The ligaments about the tibiofibular joint and ankle stabilize and guide this basic hinge joint. Ankle ligament injury most commonly occurs with sudden foot inversion, when the outer border of the foot rolls toward the opposite foot. 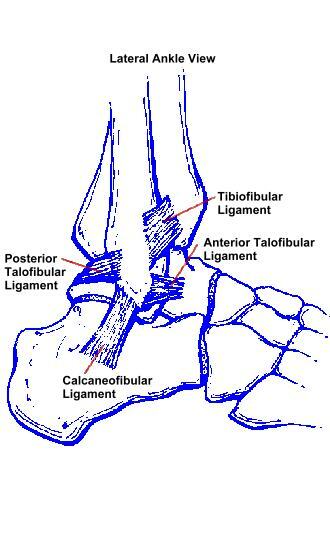 Generally, the anterior talofibular ligament is ruptured first, followed by the calcaneofibular and posterior talofibular ligaments as severity increases. Ankle sprain severity grade is based on a physical exam. The mildest grade has no physical laxity and only ligament tenderness. The second grade has anterior talofibular partial tearing of the ligaments involved, and the third grade has complete ligament disruption. The severity of ligament injury correlates well with a calcaneofibular disability, time to return to work or sports, and the ligament risk of a recurrent ankle sprain. Treatment is based upon the grade or severity of the injury. This site was created to educate patients about Common Orthopaedic problems and Sports Medicine problems and their surgical and nonsurgical treatment. The content contains the views and experience of the Physicians. No two patients are precisely alike. If you are concerned about your own medical problem then you should consult your own Physician or Orthopaedist. If you are in Rhode Island and have questions, please contact us. I hope that you find this site informative and helpful.